Born and educated in the Philippines, Art immigrated to Canada in 1976. Excited at the prospect of pursuing his passion for painting, he enrolled in workshops to gain knowledge of the business of Art in Canada. Today he lives in Southern Ontario with his wife where the surrounding abounds with beautiful subject matter. “If only we would stop and appreciate the beauty that surrounds us.” It has served him well as most of his paintings depict rural Ontario. 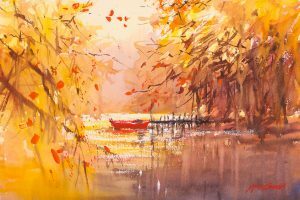 From oil to watercolor and acrylics, Art has proven that he can handle all three mediums very well. Being more at ease with watercolors, Art conducts workshops all across Canada, United States and Europe using the medium with expertise.